Donations go directly to Food For Free Committee, Inc. Thank you for making a pledge to Support Food For Free. We will notify you by email when the fundraiser is launched! to endorse Ahmad Saadat's fundraiser for Food For Free Committee, Inc.. I am a long time resident of Massachusetts and a father of two girls. As I watch them grow so fast, I try very hard to teach them the importance of giving and contributing to our community by helping others in need. This year, I wanted to go beyond just donating my own funds to various causes. I wanted to have a more long-term impact in the lives of those who are not as fortunate as I am - to create a small ripple. After some research and good fortune, I came across two great organizations to help me achieve my goals. First, Social Seam, where I can recruit people and businesses to join my cause and second, Food For Free. Their mission of preventing food from wasting, distributing to families, in addition to farming their own food, provides some solutions in the short and long term. In addition to this campaign, I plan to spend time in the field - in summer - as volunteer along side my kids to support this organization and I ask you to join me in this great cause. So, please donate and get rewards for doing good. But more importantly, share this fundraiser through email, facebook, twitter, or just tell your friends. Let's use the power of social network to help a great organization and a wonderful cause of reducing food waste and helping others. Donations will go to Food For Free Committee, Inc. I'm ready to post this and get the word out to my friends and family and donate! Please let me know whenever I can do so. Endorse Ahmad Saadat's fundraiser for Food For Free Committee, Inc..
Log In or Create An Account to endorse Ahmad Saadat's fundraiser for Food For Free Committee, Inc..
Food For Free began in 1981 when a group of friends realized that local meal programs were struggling to put food on their tables. With borrowed trucks, these volunteers gathered fruit, vegetables, and bread-food that would have been thrown away-and delivered it to meal programs, pantries, and shelters. Over the next two years, this volunteer effort gained the support of established non-profits and local government. 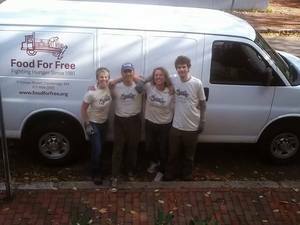 Food For Free was incorporated in 1983 and received 501(c)(3) status in 1985. Our Produce Rescue and Prepared Foods Rescue programs now serve 100+ food programs each year, including not only pantries, meals, and shelters, but also day care centers, after-school programs, clinics, and drop-in centers. In the last year, we have distributed over 1 million pounds of food. Our other programs, Home Delivery, The Transportation Partnership, and Field of Greens, complement our food rescue work by getting fresh healthy food to the people who need it. We believe that everyone in our community deserves year-round access to fresh, healthy foods. Pledge to "Support Food For Free"
Donate to "Support Food For Free"